While vision is one of the most important functions in our body, we more often than not do not think about taking care of it until problems start to appear. Indeed, with age, ailments such as age related macular degeneration or cataracts can develop and hinder our eyesight. However, what most people still do not know is that great natural supplements are available on the market claiming to delay the progression of such diseases and even to improve overall vision. In this article, we will take a look at Vitabiotics’ take on vision supplements with its Ultra Bilberry, Lutein and Zeaxanthin supplement. How does it deliver on its promises? Is it a good supplement to take to maintain a healthy eyesight? Let’s take a closer look. Bilberry is essentially a type of blueberries found in Europe only. They are often used in supplements due to their numerous health benefits, including antioxidant properties. As a consequence, bilberries can help reduce inflammation in the body and slow down the development of diseases linked to oxidative stress. Age related macular degeneration is one of these diseases. A small number of studies, with the main one published in the Journal of Nutrition, Health and Aging, have also suggested that bilberry can fight against eye fatigue on a daily basis. For people with already damaged retinas, it is recommended to take around 160mg of bilberry extract per day. Vitabiotics Ultra Bilberry, Lutein and Zeaxanthin provides 125mg of bilberry extract, which converts to 500mg bilberry, which seems to be a fair amount for users who are trying to prevent rather than cure. Zeaxanthin is a carotenoid which is naturally found in the macula, a small part of the retina located at the back of the eye which is responsible for central vision, colour vision and vision of details. There, zeaxanthin acts as a light blocker and prevents harmful sunlight rays to damage the retina and the macula, which can lead to a loss of vision. Zeaxanthin also blocks blue light, which has been linked to oxidative stress, from entering the macula. Zeaxanthin has also been proven to improve general vision in healthy individuals and is thus an essential ingredient of any good vision supplement. The recommended effective dosage is 2mg per day in healthy adults, which is exactly the amount contained in Vitabiotics Ultra Bilberry, Lutein and Zeaxanthin. Lutein is, just like zeaxanthin, a carotenoid naturally found in the macula, in the human eye. Similarly, it acts as a light and blue light blocker in order to protect the macula from burning and oxidative stress. As such, it is a popular ingredient in vision supplements. Lutein is also used in patients suffering from age-related macular disease and cataracts, and has been proven to be efficient over the years. Indeed, lutein is often referred to as the eye vitamin. Lutein can also be found in foods such as leafy greens and fruit. The scientific community recommends a minimum dosage of 6mg per day for lutein to be effective as a vision supplement. Vitabiotics Ultra Bilberry, Lutein and Zeaxanthin contains 10mg of lutein, which is therefore a great amount. 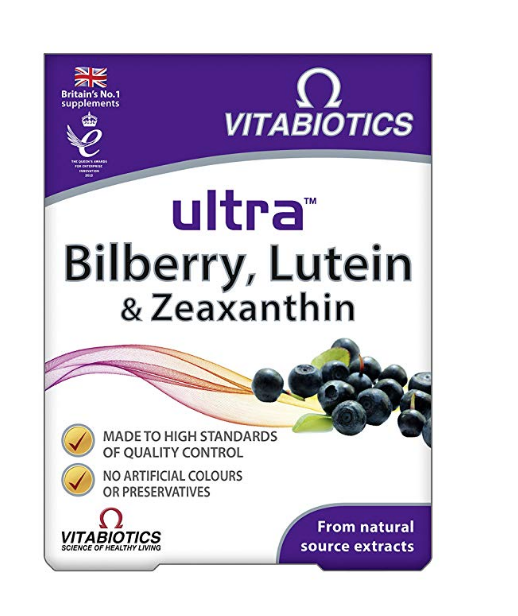 Vitabiotics Ultra Bilberry, Lutein and Zeaxanthin is generally safe to use. However, bilberry can interact with a certain number of common medications, such as anti-diabetes drugs and blood thinners, so caution is required before starting taking this supplement. The use of bilberry extract over a long period of time is also suspected to have adverse effects on health due to the presence of tannins, but research is still ongoing to confirm whether this is accurate. Take one tablet a day, to be swallowed with a glass of water. Do not chew the tablet. Vitabiotics Ultra Bilberry, Lutein and Zeaxanthin can be taken with other multivitamin supplements from the Vitabiotics range. Vitabiotics Ultra Bilberry, Lutein and Zeaxanthin is getting really positive reviews from customers who have seen significant improvement in their vision, measured by eye tests. Other customers with the onset of age-related macular degeneration have also noticed a stall in the worsening of their symptoms. Vitabiotics Ultra Bilberry, Lutein and Zeaxanthin is good vision supplement that our team can trustfully recommend. It contains high quality, naturally sourced ingredients which have proven their efficiency in enhancing vision and slowing down eye related diseases such as age related macular degeneration and cataracts. The only downside of Vitabiotics Ultra Bilberry, Lutein and Zeaxanthin is the fact that bilberry extract can interact with common prescription medications such as blood thinners and anti diabetes drugs. As a consequence, we recommend talking to your GP before taking this supplement. Overall, Vitabiotics Ultra Bilberry, Lutein and Zeaxanthin fares really well compared to other supplements on the UK market and deserves a green light from us.